The ANSI Z136.6 is a necessary tool for anyone operating lasers outdoors. Z136.6 is designed for use by anyone operating lasers outdoors; from laser light shows, scientific/astronomical research, to military (DOE, DoD). This latest edition was created with the goal to update, clarify, and streamline an already established, recognized standard to better reflect today’s outdoor laser operator’s needs. Single column format and index for improved readability and searchability, and color added to figures for ease of use. Complete rewrite of the Control Measures section to include the removal of most manufacturer-specific requirements, and the addition of an expanded and standalone military-specific section. Metric unit standardization across the standard means no more pesky conversions. New definitions and expanded content for visual interference zones around airports and general critical tasks. Laser hazard classification revised to include a comparison table between 2000 & 2014 version of ANSI Z136.1 and better explain the purpose and types of hazard classification. General section and formatting updates to better reflect today’s jargon. 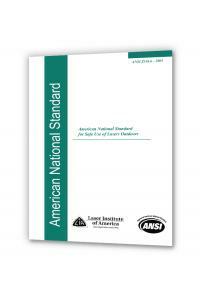 The standard is designed to be used in conjunction with the ANSI Z136.1.